The late Abe Yoshiteru 9 dan (September 28, 1941~July 3, 2000) was renowned as a studious player who tried to be present in as many venues as serious games of go were played, either by professionals or amateurs. 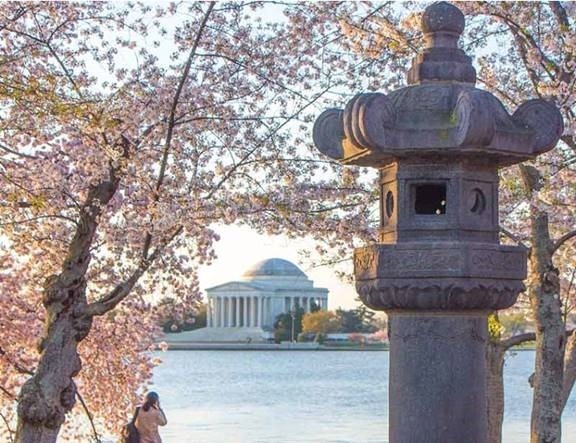 He became a student [insei] at the Nihon Ki-in [Japanese Go Association] at the age of 13, rising to professional status six years later. By 1970 he had reached the rank of 7 dan. For years Abe reported on the go scene every month in the pages of Kido magazine. The following article gives a good idea of how interesting those reports were. Played on November 1972 at the Nihon Ki-in. 99 moves. Black wins by resignation. When it comes to tactics used in a local fight, professional players rarely make mistakes. For that reason, they make every effort to draw out their games. For a game to end before 100 moves have been played is exceedingly uncommon. However, professional players are also the offspring of human beings, so on occasion they misread a simple response to be given. Then, there is the humble bowing of a head and a withdrawal from the scene. Pushing through with White 84 and cutting with 86 is an example of this. The sequence through the turning move of Black 97 is an unforked path. White then cut at 98, reading that White wins the race to capture, but this was the misreading. 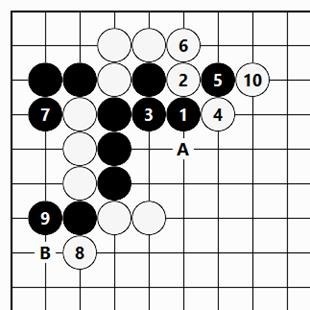 In this position, the empty triangle of Black 99 is a good move that extends the liberties of the Black group. No matter what White does, the race to capture is lost by one move. 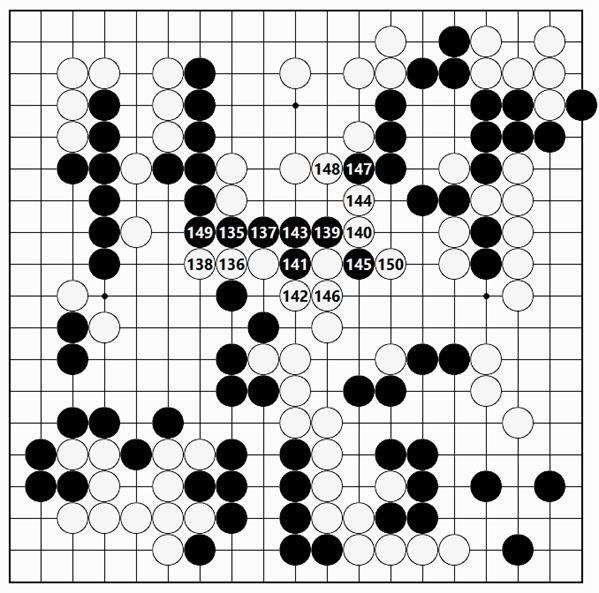 Although this is a fine move, no amateur go player would ever consider playing it, and even among professionals, it is not strange for the move to be overlooked. Still, Kamimura 6 dan was unexpectedly reckless in not reading this out. For Kamimura 6 dan, Takemiya 6 dan is a tough nemesis. He has almost never won against him. It was his consciousness of his tough nemesis that led directly to his simple miss. Well then, why does White lose by one move? Please analyze that in detail. When White fills a liberty with 1, if this move does not work, White cannot win the race to capture. 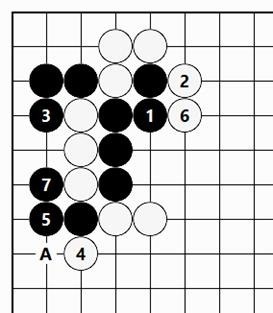 However, by simply extending with Black 2, which is a strong move for survival [shinogi], even if White fills a liberty with 3, the ataris of Black 4 and 6 increase the liberties of Black’s stones. …White might try to play the atari at 1, but Black 2 through 10 leaves White badly off. Black 99 is the only move that ensures survival [shinogi]. Any other move would have saddled Black with a loss. Please test out the alternatives independently. 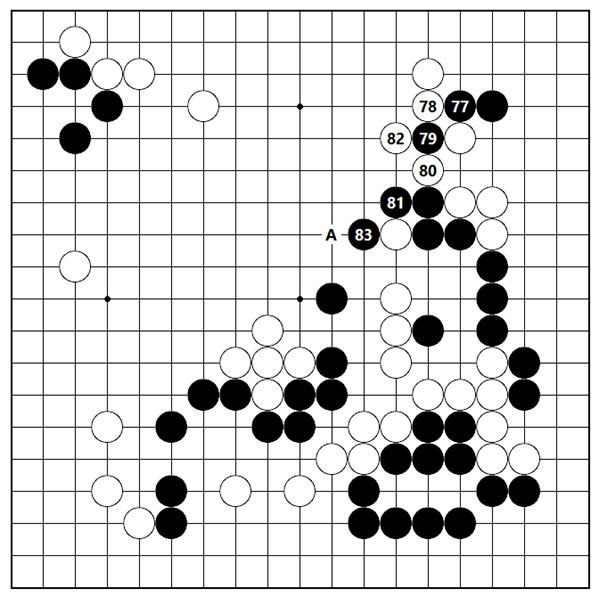 Since Fujisawa Hosai 9 dan was playing White, he used his usual imitation go [mane-go]. When Black made the fencing-in move of 17, White invaded at 18 in order to neutralize the imitation go set-up. 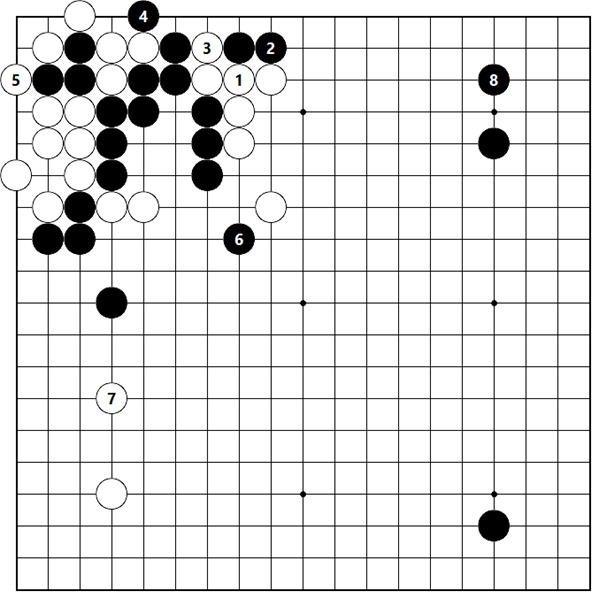 With the moves through Black’s press at 25, Black’s territorial framework [moyo] from the right side into the center has become deep and wide. 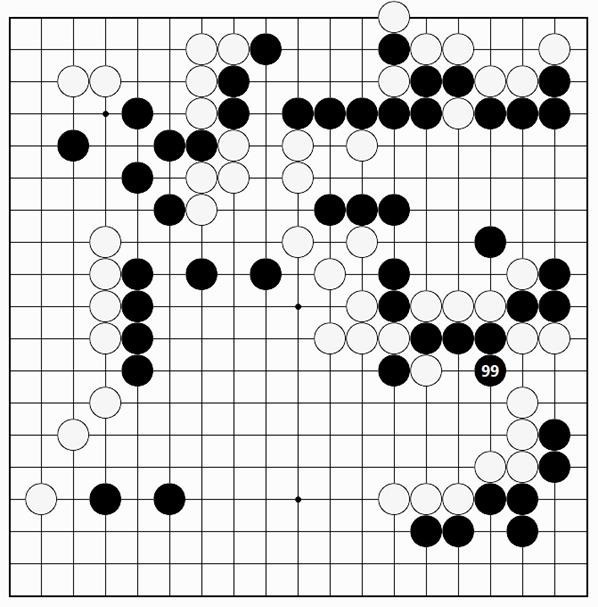 Therefore, White makes a somewhat deep invasion into Black’s territorial framework with 26. Hosai 9 dan is also one of the long-thinking faction, while Kada 9 dan is part of the far right wing [presumably meaning that Kada uses many hours on the clock to make his moves]. In making the fencing-in move of Black 27, Kada used 2 hours and 54 minutes, and for the peeping move from above with Black 37, 2 hours 48 minutes, which are records. From Black 27 to 37, both sides together used practically all their time on the clock. Therefore, this game displays the essence of the long-thinking faction and Figure 2 may be said to be Exhibit A. …to play the peep of Black 1. However, it does not seem as though White’s group can be captured. When White plays 4, Black cannot avoid pulling back to 5. Should Black play elsewhere, the placement of White 15 is severe. 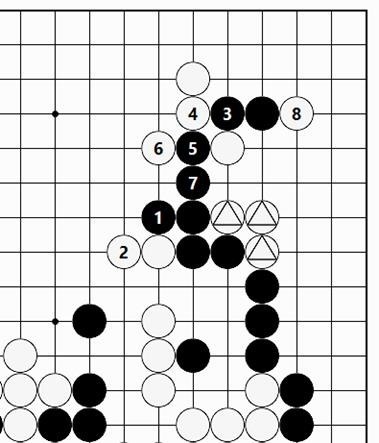 The forcing move of White 6 is the vital point. When Black defends at 7, White plays the jumping attachment of 8 followed by the sequence through the forcing moves of White 14, 16 and 18. The variation ends with White 20, which makes life for the group. …should Black go for the capture with 1, how will that turn out? If White comes on with 2, Black cannot omit replying at 3. Starting with the attachment of 4, White makes the forcing moves of 14 and 16, then plays up against Black’s stone with 18. This makes equivalent options of Black 19 and White 20. Likewise, White is alive here. Reading out all of the exchanges in this area took 2 hours and 48 minutes. Regardless of that, as might be expected, Black 37 is a strong move that makes the game painful and difficult for White. The hanging connection of White 40 makes tenacious shape, including the possibility of a ko fight. Then White pushes through at 42 and 44. 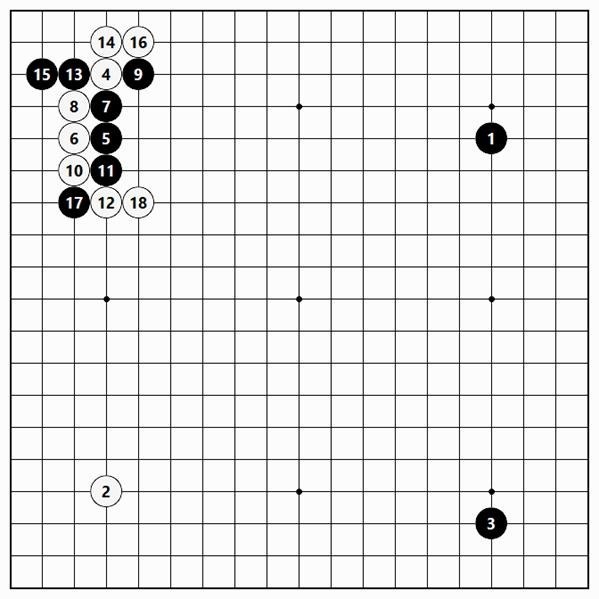 When White attaches at 46, Black has potential problems in the corner ["bad aji"]. Consequently, White’s group cannot be captured unconditionally. What Black has to do in response is to play atari at 47, bringing about the ko fight. From White 50 through Black’s taking hold of White’s stone with 73, a violent collision takes place. These moves are worthy of close study. In the end, a swap takes place, with Black capturing half of White’s group, eliminating potential problems ["bad aji"]. This board position seems to be somewhat advantageous for Black. It is regrettable that late Black made a bad move that lost the game. Played in November 1972 at the Nihon Ki-in. A new variation has been born in the Avalanche Joseki. The parent at the birth was Kajiwara 9 dan, who has a sterling reputation for inventing and playing new moves. I enjoy seeing new moves played. I admire those who undergo the painful and difficult process of coming up with them and respectfully bring them to the attention of the go playing public. 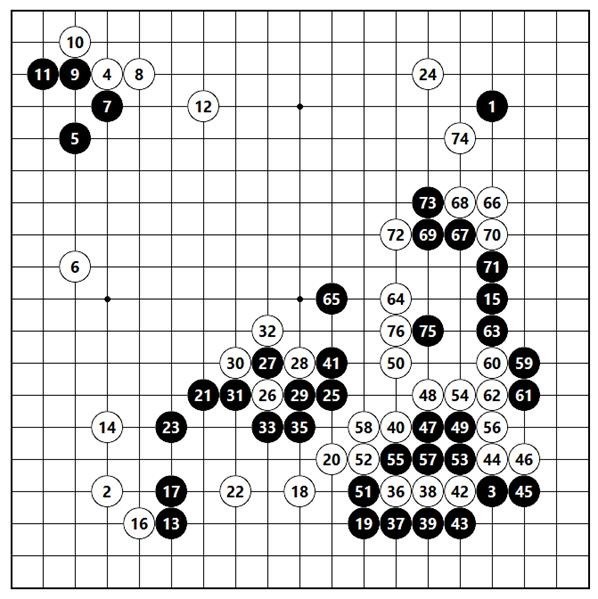 In the upper left corner is the beginning of the Avalanche Joseki. 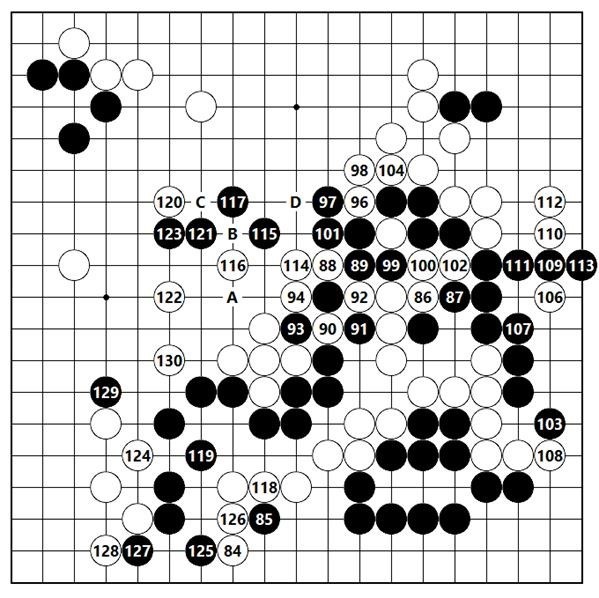 The solid connection of Black 19 is a new move that has recognized value. For the near future it is likely this move will become fashionable to play. 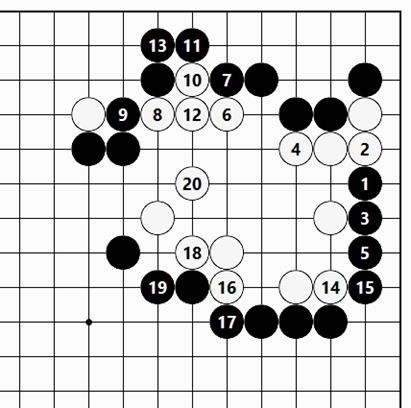 White 20 is a bad move that invites the tesuji of Black 21. This makes the board position painful and difficult for White. When Black can block at 27 and also make the knight’s move of Black 29, playing on both sides of the corner, White’s position is no good. The hanging connection of Black 1 through White 10 is the old variation. Following this, depending on the development across the board the hane of White A and the block at B are forcing moves. 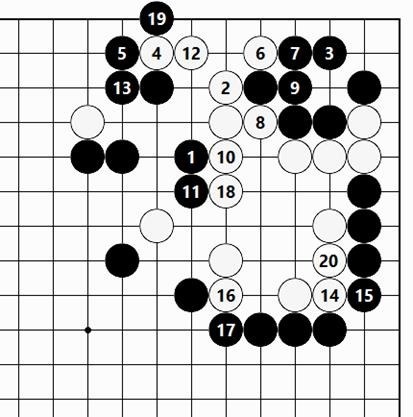 This joseki has been thought to be somewhat favorable for White. 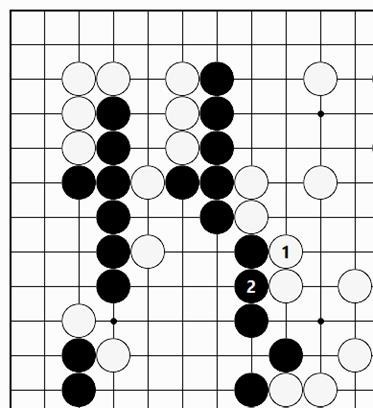 In response to the connection of Black 1, the hane of White 2 through Black 7 is standard. Compared to Diagram 1, the block of White A is not a forcing move. In addition, unless White plays another move in the center, White’s shape cannot be considered complete. Because of the preceding explanation, Diagram 2 is seen as being in general equal. The peep of White 30 is met by the attachment of Black 33. But it was also good to just connect at 39. After that, White would not have a move to play that is precisely suitable for the board position. Rather than the peep of Black 41, the fencing-in move of Black A would be standard, and may be considered as making the game advantageous for Black. 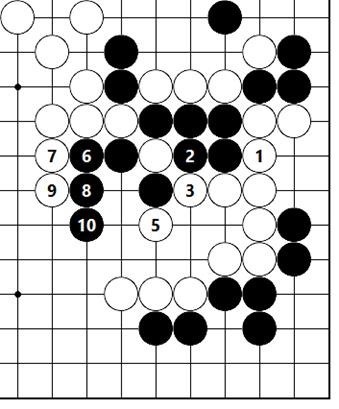 According to Kajiwara 9 dan’s reading, if White connects at 1, Black moves out at 2. Should White then play at 3, Black forces at 4 and makes the fencing-in move of 6. If White continues with the move at 7, I intended to take sente to make the enclosure of the upper right corner with Black 8. Around this point in the game, Black is still well off. Played 0n November 1972 at the Nihon Ki-in. 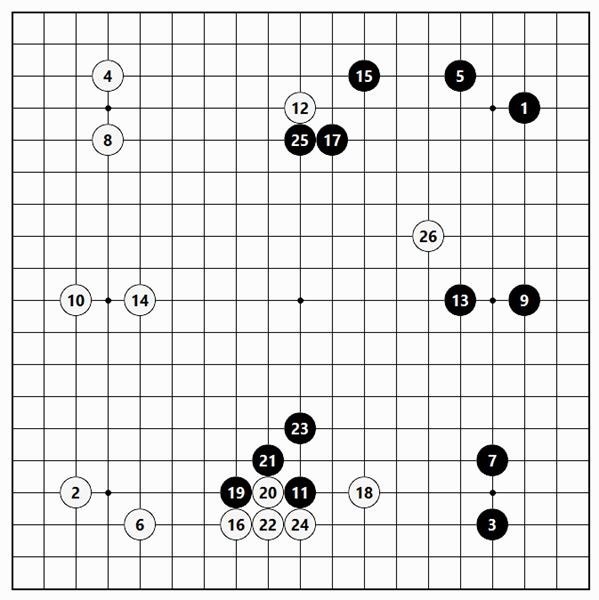 This is a big game that determined the entrance of either of the players into the Meijin league. Obviously, it was a desperate fight to the death. At this stage in the game, Kudo 8 dan essayed a uniquely individual maneuver, and subsequently raised a banner of triumph as his mark for winning entrance to the Meijin league for the first time. 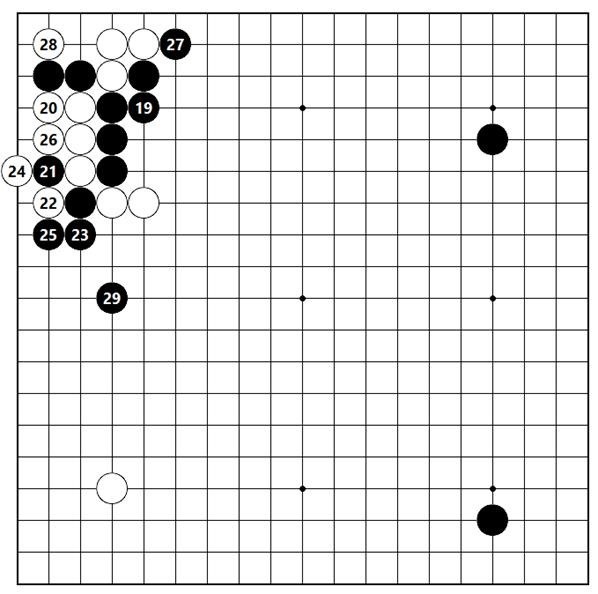 Go is a living thing, and a frightening example of what that means is presented here. The progress of this game leads to the pressing against Black’s stone with White 134. 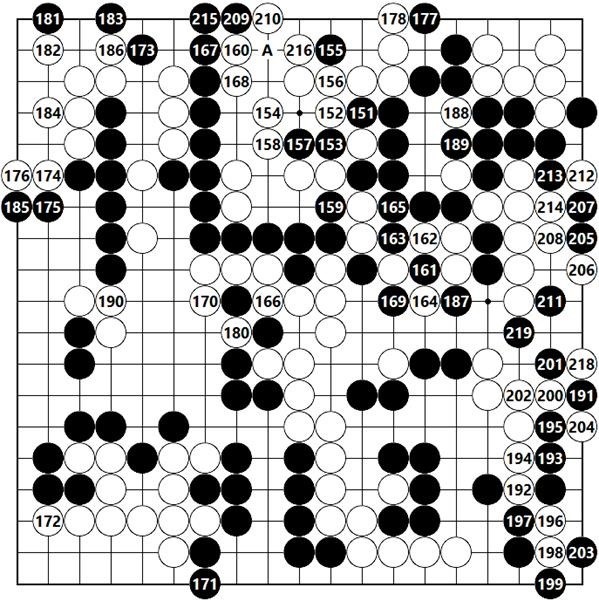 The game is in the endgame stage, with the board position indicating a close game. It may be assumed that the opponents were thoroughly worn out as they traded blow for blow. It was a critical point. In response to Black 35, the endgame proceeds in proper order with the block of White 36, but when Black thrusts through with 37, momentum leads White to play at 38, starting a chaotic fight. Should White defend at 1, Black replies at 2, and the outcome would depend on the endgame play. If Black first plays at 1, White 2 and Black 3 would ensue. In terms of the point difference, the territorial balance compared between Diagram 1 and Diagram 2 is approximately 2 points. It is this 2 point difference that led to the contention in the game. This created roiling turmoil, making everything incomprehensible. It is this frightening aspect of go, its living nature, that makes it necessary to thread a needle to survive. 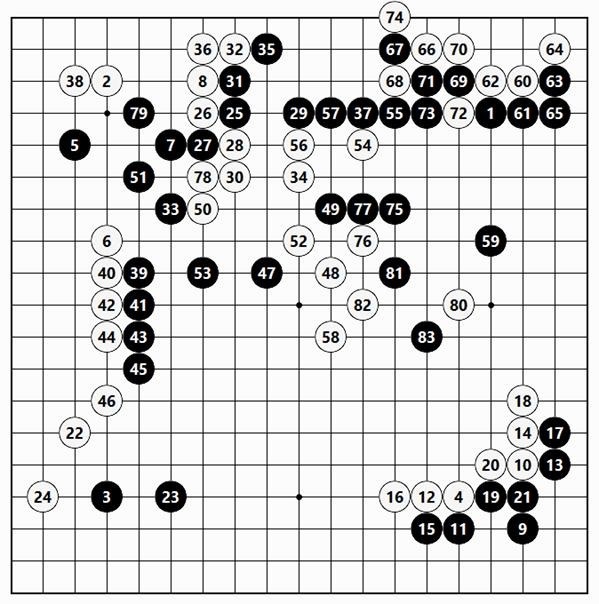 This is one of the fascinating things about go. 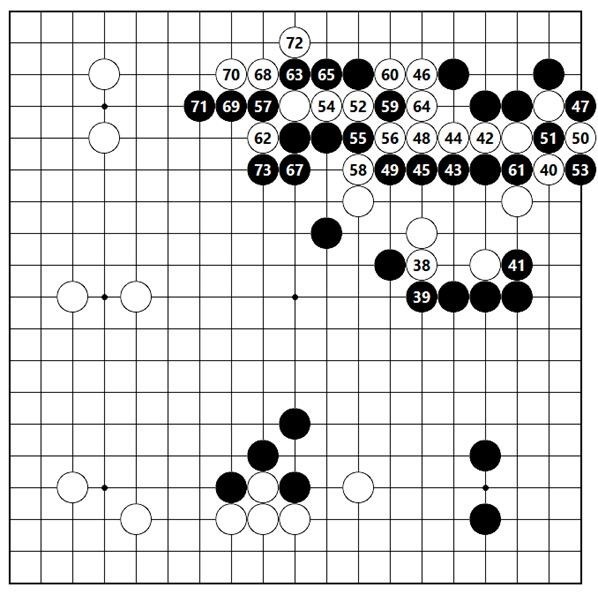 In regards to Black’s group in the upper right area, the single move at 89 would make life, but that would let White connect at 66, in violation of Black’s original intent to contest the 2 point difference. From here on Black’s doggedness is the thing to focus on. Black plays forcing moves from 51 through 57, then cuts at 59. This is a challenge to White’s group on the upper side, proclaiming in effect that it can be captured. Since Black A is possible, White would have the worst of it in a race to capture, so there is no alternative but to live with White 60. Next, the wedging-in move of Black 61 is severe. In the end, Black plays 65, capturing White’s key stones, which is big. Because of that, the connection of White 66 comes about. All of Black’s stones are thick and strong, while all of White’s stones are thin and weak, so Black has the advantage. 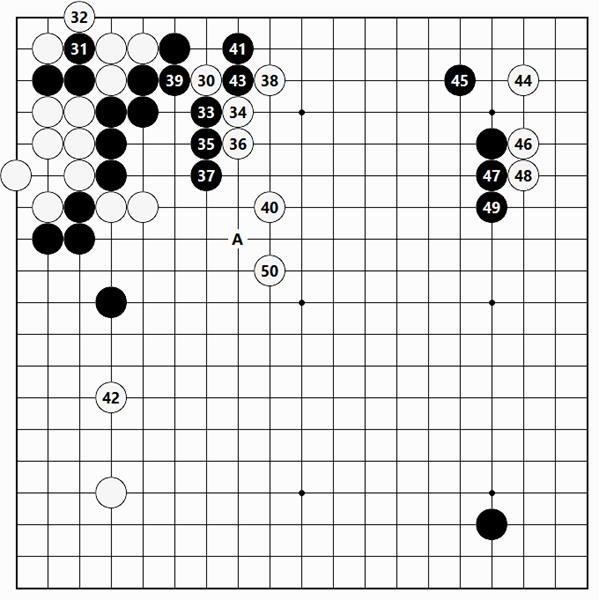 Black descends to 67 as the last spurt made possible by Black’s thickness. Even though it was the impetus of the moment, the fight over 2 points was the starting point for a huge battle, and ends with Black 119, killing White’s big group suddenly on the right side. It is interesting to watch both sides fight all-out in this game. Played on October 7, 1972 at the Central Branch of the Nihon Ki-in. This is a game of mine that was played on October 7, 1972 at the Central Branch of the Nihon Ki-in. Black 15 makes a three star point in a row [sanrensei] opening. Pushing through with Black 77 and cutting with 79 is problematical. The game still had a long way to go, but with this it was suddenly lost. My reading was really superficial here. Actually, I thought that after Black 81 and 83 White’s big group of stones could not make life. 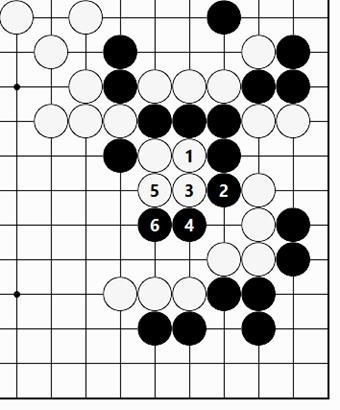 But since White makes profit in the upper right corner, unless the big group of stones is captured, the game will be bad for Black. Please consider whether this White group of stones can live or not. 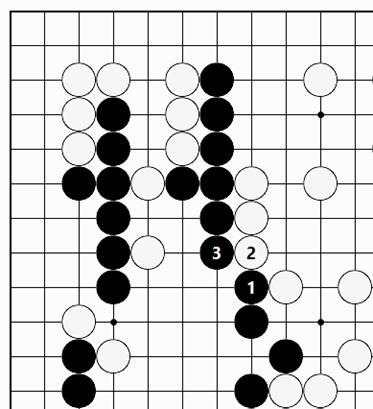 …although White can play 1 and 3, then Black can jump somewhere around A, and one way or another this seems playable for Black. 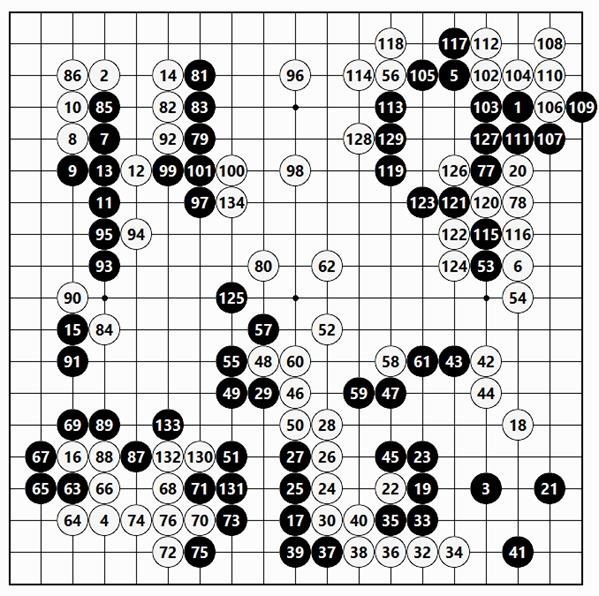 Despite the facts of the matter that have been expounded, Black simply pushed through and cut with 77 and 79 in Figure 2, but since White could live in the center, it is hard to explain what Black is doing. Black should have played in a leisurely manner with the move of 77 as the jump at A. That would have left with the advantage in the game. Please look closely at how brilliantly Isogawa 7 dan engineered survival [shinogi] for the White stones. White first plays 86, then slices through Black’s knight’s move with 88. 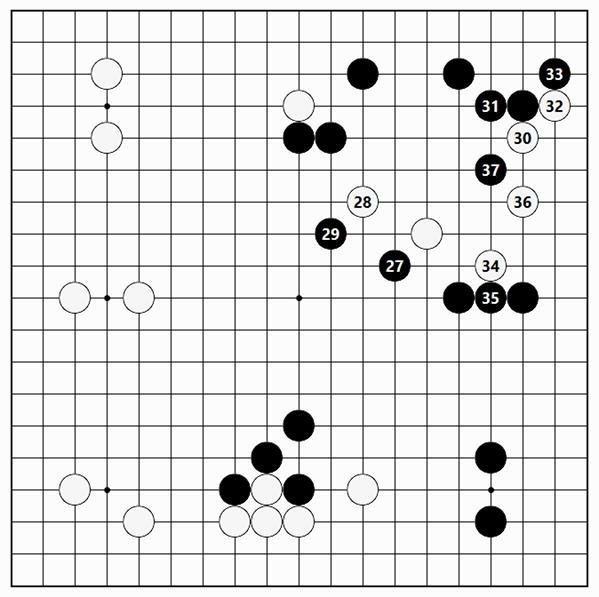 Black responds with 89, but the sequence through the cut of 102, which is a natural tesuji, somehow puts defects into Black’s shape. Things are now unpleasant for Black. And yet, all of this was more or less in line with my reading. However, I overlooked the diagonal move of White 124, a good move that left me paralyzed. Unavoidably, I made the attachment of Black 129, but the White peep of 130 at the vital point extended the liberties of White’s large group of stones, so the game became bad for Black. In addition, White A in the center is a forcing move in sente, so the group is quite strong. 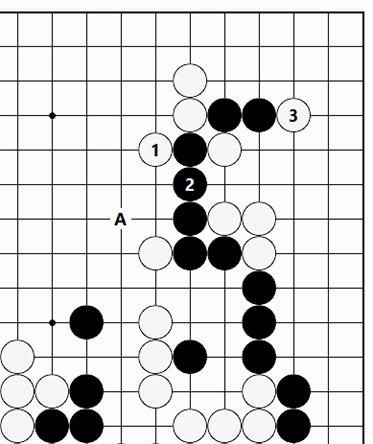 Should Black play elsewhere, White B, Black C and White D is possible.